For other uses, see Haunted Mansion (disambiguation). The Haunted Mansion is a dark ride attraction located at Disneyland Park (Disneyland Resort), Magic Kingdom, and Tokyo Disneyland. The attraction, although differing slightly in every location, places riders inside a haunted manor resided in by "999 happy haunts". Omnimover, styled as "Doom Buggies"
The Haunted Mansion features a ride-through tour in Omnimover vehicles called "Doom Buggies", and a walk-through show is displayed to riders waiting in the line queue. The attraction utilizes a range of technology, from centuries-old theatrical effects to modern special effects featuring spectral Audio-Animatronics. The Haunted Mansion has inspired two similarly themed attractions, Phantom Manor and Mystic Manor, which exist at Disneyland Paris and Hong Kong Disneyland, respectively. The idea for the Mansion precedes Disneyland and WED Enterprises, to when Walt Disney hired the first of his Imagineers. At the time, the park they were developing the attraction for was supposed to be located across from the studios. In 1951, the first known illustration of the park showed a main street setting, green fields, western village and a carnival.Disney Legend Harper Goff developed a black-and-white sketch of a crooked street leading away from main street by a peaceful church and graveyard, with a run-down manor perched high on a hill that towered over main street. Disney assigned Imagineer Ken Anderson to create a story using Goff's idea. Plans were made to build a New Orleans-themed land in the small transition area between Frontierland and Adventureland. Weeks later, New Orleans Square appeared on the souvenir map and promised a thieves market, a pirate wax museum, and a haunted house walk-through. Anderson studied New Orleans and old plantations and came up with a drawing of an antebellum manor overgrown with weeds, dead trees, swarms of bats and boarded doors and windows topped by a screeching cat as a weather vane. Disney, however, rejected the idea of having a run-down building in his park. He visited the Winchester Mystery House in San Jose, California, and was captivated by the massive mansion with its stairs to nowhere, doors that opened to walls and holes, and elevators. Anderson envisioned stories for the mansion, including tales of a ghostly sea captain who killed his nosy bride and then hanged himself, a mansion home to an unfortunate family, and a ghostly wedding party with well-known Disney villains and spooks. Imagineers Rolly Crump and Yale Gracey recreated Ken Anderson's stories in a studio at WED Enterprises. In 1961, handbills announcing a 1963 opening of the Haunted Mansion were given out at Disneyland's main entrance. Construction began a year later, and the exterior was completed in 1963. The attraction was previewed in a 1965 episode of Walt Disney's Wonderful World of Color, but the attraction itself would not open until 1969. The six-year delay owed heavily to Disney's involvement in the New York World's Fair in 1964–1965 and to an attraction redesign after Walt's death in 1966. After the fair, many Imagineers such as Marc Davis, X Atencio and Claude Coats contributed ideas to the project. By this time, Ken Anderson had left the project. Rolly Crump showed Walt some designs for his version, which included bizarre objects like coffin clocks, candle men, talking chairs, man-eating plants, tiki-like busts, living gypsy wagons and a mirror with a face. Walt accepted these ideas and wanted to make the proclaimed "Museum of the Weird", a restaurant side to the now-named Haunted Mansion, similar to the Blue Bayou at Pirates of the Caribbean. Though this concept was never realized, some of its aspects were implemented into the final attraction. When Walt put Imagineers Rolly Crump and Yale Gracey in charge of creating the visual illusions for the attraction, they intended to make the "Museum of the Weird" into a separate section that guests could walk through and discover illusions from around the world. Guests would be able to see transparent ghosts and other apparitions, utilizing the Pepper's Ghost technique used in the theater since the early 1800s. Crump and Gracey were eventually given an entire warehouse to house their developments and one evening forgot to switch off the mechanics before leaving for the day. The cleaning crew was met with surprise as Crump explained, "Once, we got a call from personnel saying that the janitors requested that we leave the lights on in there due to the creepiness of all the audio-animatronic ghosts and such. We complied, but put motion sensors in the room that would extinguish the lights and turn on all the ghost effects when triggered. The next morning, we came in and found all the ghost effects still running and a broom lying in the center of the floor. Personnel called and said that the janitors would not be back." Marc Davis and Claude Coats, two of the mansion's main designers, disagreed on whether the ride should be frightening or enjoyable. Claude, originally a background artist, wanted a scary adventure, and produced renditions of moody surroundings like endless hallways, corridors of doors and numerous characterless environments. Marc, an animator and character designer, proposed variegated characters and thought the ride should be silly and full of gags. In the end, both artists got their ways when X Atencio combined their approaches and ideas, creating a transition from dark foreboding to "spirited" entertainment. The ride narration was performed by Paul Frees in the role of the Ghost Host. The attraction's theme song, "Grim Grinning Ghosts", was composed by Buddy Baker with lyrics written by X Atencio. It can be heard in nearly every area of the ride, with various instrumentations and tempos. After Disney's death in December 1966, the project evolved significantly; the Museum of the Weird restaurant idea was abandoned. The Imagineers objected to a walk-through attraction's low capacity, going so far as suggesting building two identical attractions to accommodate twice as many guests. A solution appeared with the development of the Omnimover system for Adventure Thru Inner Space. Renamed the '"Doom Buggy", the system's continuous chain of semi-enclosed vehicles offered high capacity. The cars could be set to rotate in any direction at any point, allowing the Imagineers to control what guests saw and heard throughout the show. And because each car held from one to three, it was a convenient way to divide guests into smaller groups — a better fit with the story of people wandering "alone" through a haunted house. Attraction's exterior at Disneyland in the evening. Employee previews of the Mansion were held August 6, 7, and the 8th, followed by "soft" openings on August 9 and 10 where limited numbers of park guests were allowed to ride. A "Midnight" Press Event was held on the evening of August 11. The mansion opened to all guests August 12, 1969. The public opening was announced in full-page newspaper ads, creating the anomaly of either two official openings or an advertised "soft" opening. The attraction was an immediate success, attracting record crowds and helping Disney recover from Walt's untimely death. In around 1977, WDI considered utilising the unused designs, creatures and effects that Rolly Crump had originally created for the Haunted Mansion and the Museum of the Weird as part of Professor Marvel's Gallery — "a tent show of mysteries and delights, a carousel of magic and wonder." This was to be built as part of Disneyland's Discovery Bay expansion area, and was dropped when those plans fell through. The attraction opened at Magic Kingdom in 1971 and Tokyo Disneyland in 1983. In 1999, a retrospective of the art of The Haunted Mansion was featured at The Disney Gallery above the entrance to Pirates of the Caribbean. When the 2003 film The Haunted Mansion was released, a retrospective of its art was featured in the gallery as well. In 1995, Disneyland's Haunted Mansion was updated. A phantom piano player sat at a run-down piano, just like the music room at Walt Disney World's Mansion. However, instead of the sinister Rachmaninoff-esque version of "Grim Grinning Ghosts", a dark version of Richard Wagner's Bridal March plays. In 2001, a newer, more detailed safety spiel was added to the onboard audio of the doom buggy in the Load Area, now featuring voice-over artist and Paul Frees impersonator Joe Leahy, giving a bilingual safety spiel as part of a park-wide attempt to increase safety at attractions. In October 2001, Haunted Mansion Holiday premiered, a seasonal overlay featuring characters from the 1993 film The Nightmare Before Christmas. The attraction still opens during the holiday season to this day. In 2007, the Walt Disney World Haunted Mansion was reopened to the public. Included in the update was a more elaborate transformation of the foyer's portrait, new sound, visual and audio effects in the Stretching Room, and a new Endless Staircase scene, which replaced two rubber spiders before guests would see the Endless Hallway.This blurb explains what took place in the mansion and what guests can expect. In March 2011, a new "interactive queue" debuted at the Walt Disney World location, with new crypts and tombstones honoring Imagineers; a murder mystery for guests to solve featuring the sinister Dread Family; the Composer Crypt, which features musical instruments that play variations of "Grim Grinning Ghosts" when touched; the Mariner's brine-filled sepulcher, whose ghost sings and sneezes from within, and a crypt for Prudence Pock the poetess, which features haunted moving books & Prudence's ghost writing invisibly in her poem book. Guests can solve the unfinished poems by speaking into microphones located on the crypt. The FastPass+ line skips the queue altogether and leads guests straight to the Foyer doors. On April 10, 2015, it was officially confirmed that an iconic Haunted Mansion character, The Hatbox Ghost, would return to Disneyland's Haunted Mansion. The character returned on May 9, 2015. The Hatbox Ghost was originally a part of the attraction when it opened in 1969, but was removed when the illusion involving the specter's head was not convincing enough. Entering the queuing area through a pair of ornate gates, guests find themselves in the antebellum-era mansion's well-tended gardens and courtyards. The queuing path leads guests past a pet cemetery, a mausoleum with pun names, a cemetery at the top whose tombstones bear the names of the Imagineers who created this attraction, and a white carriage hearse led by an invisible horse which occasionally nickers. Stepping onto the porch, guests are admitted inside the mansion through a doorway on the far right of the house into the Foyer, lit by a large, flickering, cobweb-covered chandelier and surrounding candelabras. In the Foyer, the deep, resonant voice of an invisible spirit (Paul Frees) sets the tone of the attraction with a short opening monologue, accompanied by a funeral dirge variation of Grim Grinning Ghosts. "When hinges creep in doorless chambers, and strange and frightening sounds echo through the halls, whenever candle lights flicker where the air is deathly still, that is the time when ghosts are present, practicing their terror with ghoulish delight..."
With a sudden thunderclap, the lights go out and the ceiling disappears. A ghastly vision manifests above: the skeletal corpse of the Ghost Host dangling from a taut rope inside an octagonal cupola with four curtainless windows (rather than the hexagonal cupola with six curtained windows seen on the exterior), illuminated by flashes of lightning. Seconds later, the room plunges into darkness, and a bloodcurdling scream is heard — falling from the ceiling to the floor, ending with the sound of the corpse hitting the floor. The Portrait Gallery, which guests walk through after exiting the Stretching Room. As the chamber is re-lit, a wall opens, exposing a Portrait Gallery, which takes guests underneath the Disneyland Railroad and to where the ride actually begins, in a separate warehouse-style show building hidden from within the park by trees. As lightning flashes from the windows on the opposite side of the gallery, the portraits transform into images of ghosts and monsters in synchronization with the lightning. At the corridor's far end are two statuary busts depicting a strict-looking man and woman. The statues appear to turn and gaze at guests, following their every move. Turning a corner, guests enter the Load Area, where a seemingly endless stream of black carriages, known as Doom Buggies, descend one staircase and ascend another. Beyond the track, clouds drift past a limbo of boundless mist and decay. The guests then board the carriages, accompanied by the Ghost Host (who lowers the safety bar and provides a safety spiel). Once guests ascend the pitch-black Staircase to the second floor (bringing them up to ground level within the show building), they come across a moving suit of armor, and a chair which appears to be embroidered with a hidden abstract face. The Doom Buggies also pass by the end of a seemingly Endless Hallway. Halfway down the hallway is a candelabra, floating eerily. Turning away from the Endless Hallway, guests travel past a glass Conservatory filled with dead, withered plants and flowers. In the middle of the room is a coffin occupied by a restless "guest", plaintively wailing for someone to "Let me out!'. Perched near the coffin is a black raven with glowing red eyes. The Doom Buggies continue down a Corridor of Doors. The sounds of pounding, shrieking, calls for help, screams, knocking, and maniacal laughter can be heard from behind the doors. Knockers and handles are moved by unseen hands and some doors appear to be "breathing." The walls, covered in demon-faced wallpaper, are adorned with daguerreotypes of screaming and grinning corpses, and a large painting of the Ghost Host with a noose around his neck and holding a hatchet. A demonic grandfather clock chimes 13 as its hands spin counter-clockwise and the shadow of a claw passes over it. Serpents and spiders, tail of a rat... Call in the spirits, wherever they're at. Rap on a table, it's time to respond... Send us a message from somewhere beyond. Goblins and ghoulies from last Halloween... Awaken the spirits with your tambourine! Creepies and crawlies, toads in a pond... Let there be music from regions beyond! Wizards and witches, wherever you dwell... Give us a hint by ringing a bell. Floating objects and instruments respond in turn. Before exiting the Séance Circle, guests pass a large, ancient tome entitled "Necronomicon: Book of the Dead" resting on a stand, with the book opened to pages 1312 and 1313. Page 1312 contains a cloaked version of Ezra the HitchHiking Ghost, while page 1313 contains Leota's incantations. After leaving the Séance Circle, guests move along a balcony overlooking a birthday party taking place in a Grand Hall, with a number of ghosts dancing and reveling. Ghosts are seen entering the room through a broken door, where a hearse has crashed with its coffin (and its contents) sliding out. Eerie phantoms are seen flying in and out of the windows above. A merry ghost is seen sitting atop the mantle of a fireplace with a mysterious green fire, with his arm wrapped around a bust. An elderly ghost is seen rocking back and forth in a chair, a book in her lap. Many ghosts have gathered around a dinner table, where a ghost is blowing out candles on a birthday cake. A massive chandelier hangs above the table on which a couple is perched and another ghost named Pickwick swings from by his cane. Another balcony is seen across the room, where a curtained doorway is situated between two portraits of dueling gunmen. From time to time, the ghosts of both duelists appear and shoot at each other with their pistols. A number of elegantly dressed couples are seen below, waltzing to a discordant version of the attraction's theme song played on a pipe organ (Captain Nemo's organ set piece from 20,000 Leagues Under the Sea) by a ghostly gentleman wearing a top hat, while banshees float out of its pipes. As she raises her arms, a hatchet appears and disappears in her hands between vows. The Doom Buggies drift out of an Attic window and onto the balcony, coming face to face with the Hatbox Ghost amidst a starry night sky filled with wispy spirits rising from the Graveyard below. The Doom Buggies turn around, and tip backward down a 15-percent grade surrounded by dark, ghoulish trees with knotted expressions. The red-eyed raven (previously seen in the Conservatory and Séance Circle) caws at guests from a branch overhead as guests enter the Graveyard. The Doom Buggies then reach the ground and turn towards the gate of the Graveyard. There stands a caretaker and his dog, the attraction's only "living" characters. The caretaker cowers in fright, an expression of terror on his face, while his emaciated dog whines and whimpers. Around the corner, a ghostly band of minstrels plays a jazzy rendition of "Grim Grinning Ghosts" as a family of cats and two owls join in harmony. Ghouls pop up from behind tombstones, a king and queen balance on a teeter-totter, and a skeletal hellhound howls from behind guests. The Doom Buggies travel down a hill and turn to see five expressive haunted busts singing "Grim Grinning Ghosts" in barbershop harmony. Next, guests encounter a ghostly tea party surrounding a hearse stuck in the mud. A bony arm protrudes from a crypt with a wine glass in its hand, while banshees ride bicycles in the distance. An Egyptian mummy sits up in his sarcophagus, holding a cup of tea and singing along, while the ghost of a "wise old man" from the Renaissance period holds an ear trumpet to his ear in an attempt to make out the muffled words of the mummy. The Doom Buggies then turn and pass a group of singing ghosts (an operatic pair, a decapitated knight, a masked executioner, and a prisoner) standing in front of a series of crypts. A bony arm holding a trowel protrudes from a partially walled-up crypt, its occupant attempting to finish the job. Ah, there you are... and just in time. There's a little matter I forgot to mention: beware of HitchHiking Ghosts! They have selected you to fill our quota, and will haunt you until you return... Now I will raise the safety bar, and a ghost will follow you home! Entering the Hall of Mirrors, the Doom Buggies pass a group of three ghosts thumbing for a ride. Around the corner, in large, ornately framed mirrors, the guests see that one of the ghosts from the trio is in the carriage with them. While passing through the Hall of Mirrors, the same Singing Bust spirits from the Graveyard sing a somber tune in the background while guests proceed to the exit. Hurry back... hurry back! Be sure to bring your death certificate, if you decide to join us. Make final arrangements now. We've been 'dying' to have you. The Magic Kingdom version features a Gothic revival-style. The Haunted Mansion was an opening day attraction at Magic Kingdom in Walt Disney World, where it is part of Liberty Square. During the production and assembly of the props and audio-animatronics for Disneyland's Haunted Mansion, duplicates of everything were being made for Walt Disney World's Haunted Mansion. It was decided that the Florida version of the attraction would be slightly longer and more elaborate than its California counterpart. Paul Frees recorded additional voice-overs, including the "Ghost Host" to accompany the extra scenes in the ride. Because of the ample space within the park, the attraction's show building is much larger and not restricted by any railroad berm. When passing the graveyard gates on line, five head busts (six if you count the two busts on one stand) that contain the Dread Family, a family that killed each other for wealth. The members are Uncle Jacob, Bertie, Aunt Florence Dread (née McGriffin), The twins named Wellington and Forsythia, and Cousin Maude. Bertie killed Jacob with poison from his snake, Florence killed Bertie for revenge with her gun, Wellington and Forsythia killed Florence as revenge for Florence doing a rogue shot and killing their pet canary, and Maude killed the twins with her croquet mallet. Maude accidentally killed herself by forgetting that she put matches in her hair to hold her bun together and setting a fire that killed her. The Haunted Mansion was an opening day attraction at Tokyo Disneyland, where it is part of Fantasyland. The Tokyo Disneyland version is largely a duplicate of the Magic Kingdom version, although it features some additional scenes in the beginning of the ride and did not receive the changes made in the 2007 refurbishment of the Magic Kingdom version. Since 2001, the Haunted Mansion at Disneyland and Tokyo Disneyland is transformed into Haunted Mansion Holiday during the Halloween and Christmas seasons, inspired by Tim Burton's 1993 film The Nightmare Before Christmas. The Haunted Mansion is closed in September for a few weeks as they revamp the attraction, replacing many of the props and Audio-Animatronics with characters and themes from the movie. Disneyland Paris features Phantom Manor, a "re-imagined" version of the Haunted Mansion. The house is a Western Victorian, in the Second Empire architectural style, based on the look of the Fourth Ward School House in Virginia City, Nevada. Along with the Western architectural style, the attraction uses a Western plot to fit in with the Thunder Mesa and Frontierland backdrop. Mystic Manor, spiritually inspired by the Haunted Mansion, opened at Hong Kong Disneyland in spring 2013. Unlike the Haunted Mansion, however, it does not include references to departed spirits or the afterlife, due to differences in traditional Chinese culture. Continuing the Society of Explorers and Adventurers theme of Tokyo DisneySea, the attraction tells the story of Lord Henry Mystic and his monkey Albert. Having recently acquired an enchanted music box with the power to bring inanimate objects to life, Albert opens the box and brings all of the house's artifacts to life. 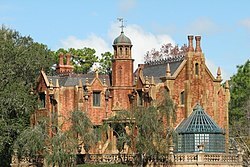 The attraction's exterior is that of a large Victorian mansion in an elaborate Queen Anne architectural style, and the experience features a trackless "ride" system and a musical score by Danny Elfman. Walt Disney Pictures produced a theatrical feature film adaptation based on the attraction and starring Eddie Murphy on November 26, 2003. In July 2010, Guillermo del Toro announced that he was set to write and produce a darker film adaptation based on the attraction, promising that it would be both scary and fun. With del Toro leaving his animated deal with Disney in late 2010 for DreamWorks Animation, there was no word on the status of this project. In October 2005, Slave Labor Graphics began publishing a bimonthly Haunted Mansion comic book anthology, with the main recurring story (Mystery of the Manse) centered around "Master Gracey" and inspired by the sea captain concepts proposed for the attraction by Ken Anderson in the 1950s. In the Mickey Mouse episode "Potatoland", Mickey and Donald build a theme park called Potatoland to fulfil Goofy's lifelong dream to go to the park, even though it never existed. One of the attractions featured was a version of The Haunted Mansion, based on potato horror stories. In January 2014, Marvel Comics began publishing Seekers of the Weird, a five-issue miniseries and first under the Disney Kingdoms imprint. The miniseries was based on the Museum of the Weird, Rolly Crump's unused precursor designs for the attraction. In March 2016, Marvel Comics began publishing a five-issue miniseries based on the attraction, released under the Disney Kingdoms imprint. A video game produced by Disney Interactive, TDK, and High Voltage Software was released in 2003, primarily based on the attraction but using some of the set designs from the film. The attraction appears and is referenced in other video games, including Epic Mickey and Kinect Disneyland Adventures. In Epic Mickey, the mansion serves as the final level of the game, and borrows elements from each mansion except Mystic Mansion. In July 2014, it was announced that a cartoon special based on the attraction, animated by Gris Grimly, was being developed in honor of the 45th anniversary, to be aired on the Disney Channel and Disney XD. Madame Leota appears in the second half of the seventh season of ABC's Once Upon a Time, portrayed by Suzy Joachim. In the horror video game, Bendy and the Ink Machine, the haunted house attraction that appears in the game's fourth chapter is based on the ride. ^ a b c d e f g h i j k l m n The History of & Changes to The Haunted Mansion (YouTube video). Park Ride History. December 4, 2017. Retrieved December 4, 2017. ^ a b c d e f g h i Haunted Mansion Secrets and History of Disneyland (YouTube video). FreshBakedDisney. December 17, 2013. Retrieved December 4, 2017. ^ a b c d e Legends of the Haunted Mansions: Halloween Special (YouTube). Offhand Disneyland. October 30, 2017. Retrieved December 18, 2017. ^ a b "Urban Legends Pages: Haunted Mansion". snopes.com. ^ Hare, James (May 6, 2015). "An EPIC Look at the History Behind the Haunted Mansion". We Love Orlando. Retrieved July 12, 2016. ^ a b c "Guillermo del Toro enters "Haunted Mansion"". Reuters. Retrieved 23 February 2016. ^ "The Neverland Files: Professor Marvel's Gallery". 2010-06-28. Archived from the original on June 28, 2010. Retrieved 2015-12-10. ^ Glover, Erin (April 10, 2015). "Legendary Hatbox Ghost Comes Out to Socialize in the Haunted Mansion at Disneyland Park in May". Disneyland Resort. Retrieved April 27, 2015. ^ a b 10 Things You're Dying To Know About The Haunted Mansion (YouTube). WhatCulture. June 17, 2017. Retrieved December 18, 2017. ^ "13 Facts About Disney's Haunted Mansion". Mental Floss. Retrieved 2016-02-19. ^ McMillan, Graeme (October 7, 2013). "Marvel and Disney Team for 'Seekers of the Weird'". Hollywood Reporter. Retrieved September 20, 2016. ^ "REVIEW: Marvel's "The Haunted Mansion" comic book brings the world famous Disneyland attraction to life on the page". Inside the Magic. Retrieved 2016-03-10. ^ Goldberg, Lesley. "Disney Prepping 'Haunted Mansion' TV Special (Exclusive)". The Hollywood Reporter. Lynne Segall. Retrieved 2 November 2015. ^ "'Once Upon a Time' bosses on rise of new big bad". EW.com. Retrieved 2018-04-22. "Disneyland's Ghost House". (2004). The "E" Ticket (41). This is the Fall 2004 issue of the magazine The "E" Ticket, which was dedicated to the Haunted Mansion at Disneyland. Eastman, Tish. (1997). "Haunting Melodies: The Story Behind Buddy Baker's Score for the Haunted Mansion". Persistence of Vision (9) 39. Persistence of Vision is an irregularly published magazine "celebrating the creative legacy of Walt Disney." Back issues can be found at The Book Palace. Smith, Paul. (1997). "Tales from the Crypt: Life in the Haunted Mansion." Persistence of Vision (9) 89. A book published by Disney giving a comprehensive history of the Haunted Mansion from early inception, in which it was a walk-through attraction, to its current form. It includes information on the Haunted Mansion movie. Surrell, Jason (2015). The Haunted Mansion: Imagineering a Disney Classic. From the Magic Kingdom (1st ed.). Disney Editions. ISBN 978-1-4847-2229-9. 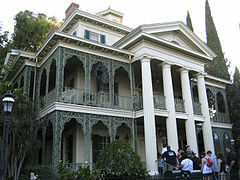 Wikimedia Commons has media related to Haunted Mansion at Disneyland.